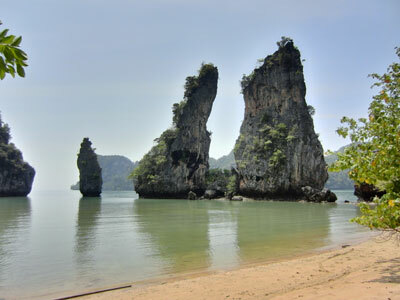 After breakfast we went down to the beach where our boatsman Lek was already waiting for us. Full of anticipation we climbed into the long-tail boat and soon we were on our way along the east coast heading north. 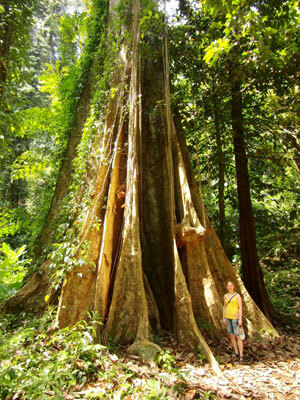 We would visit some of the small islands in the bay and the Big Tree in the jungle on the northern tip of Koh Yao Noi. A map of the tour can be found here. 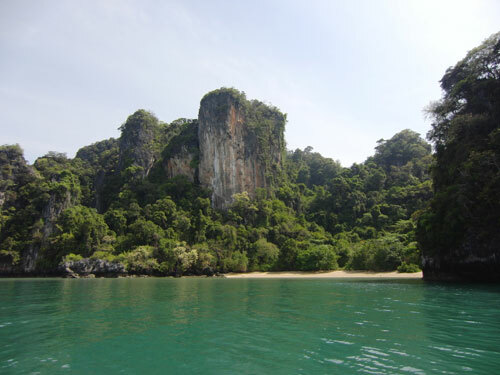 Passing the cliffs at the Paradise Resort we soon arrived at Koh Roi. 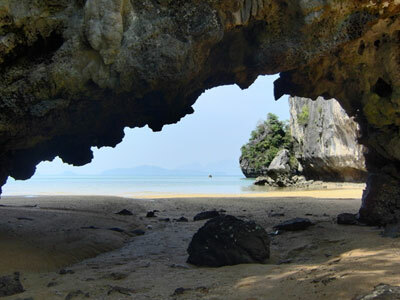 The special feature of Koh Roi is that on its western shore there is a small mouth in the rocks otherwise surrounding the whole island. 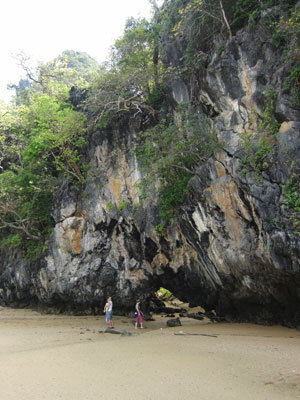 This opening can only be passed at low tide and thus you can reach the mangrove jungle inside. 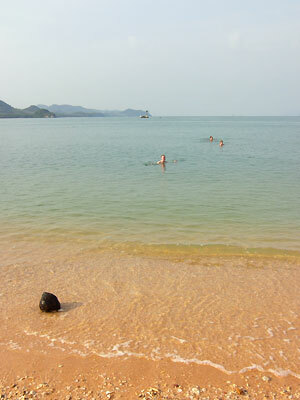 There are mudskippers in the small tidal pools and we heard noises which we thought might be monkey cries. 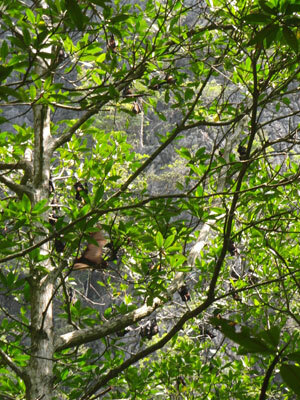 However, when we got nearer to the source of the noise, we found out that it were flying foxes (fruit bats) who seemed a bit offended by our intrusion. Before we left the island we met two canoeists who had been on their way through the archipelago for several days paddling from island to island. 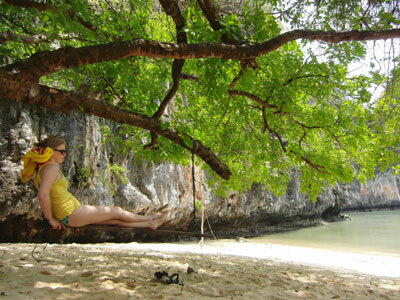 After chatting with them for a while we pulled the anchor and headed for the Big Tree. 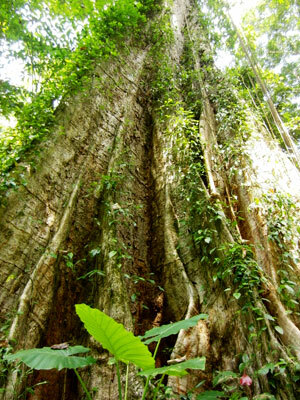 From a small beach on the northern tip of Koh Yao Noi we walked a few minutes through the dense jungle until we reached this impressive tree which is about 300 years old and several meters in diameter. 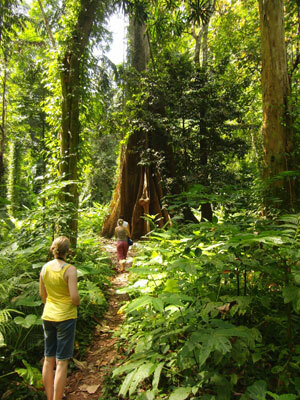 After visiting the Big Tree we continued to the Kudu islands. 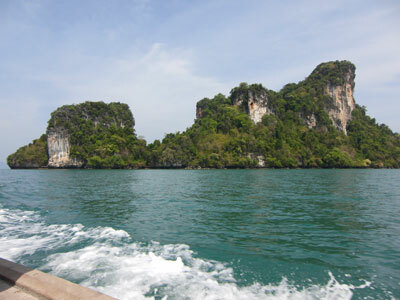 After a short stop on the smaller Koh Kudu Noi we entered the lagoon of Koh Kudu Yai. 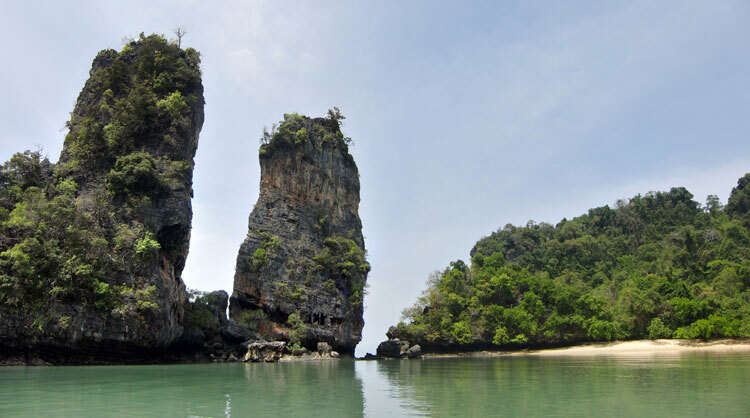 The sight of the limestone cliffs rising out of the water is truly amazing! 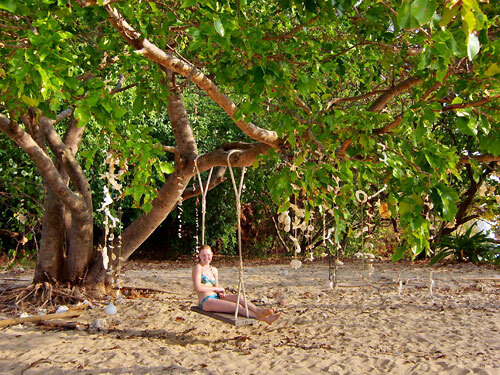 The lagoon has a marvellous sandy beach, and if you follow a narrow path through the jungle you reach a second and also very idyllic beach. 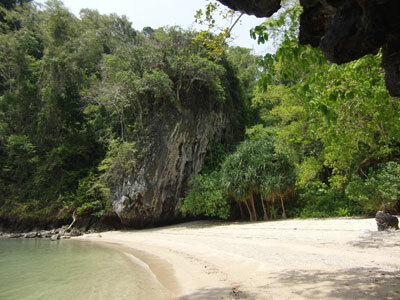 We explored the island for a while and finally unfolded our beach towels and enjoyed our packed lunch. Lek also sliced a pineapple for dessert - what a heavenly delight! never getting tired of that view! 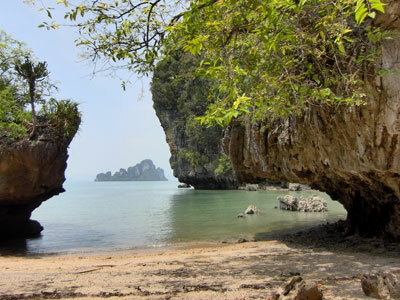 After an extensive rest we started for our last stop - the small Koh Nok to the southeast. 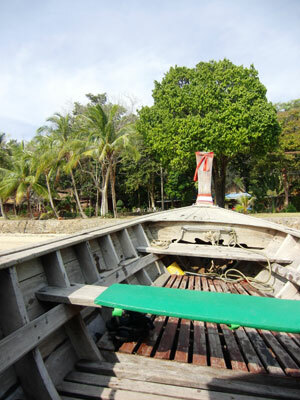 A few boats and canoes were lying on the nice tongue of sandy beach, which can easily be reached from Koh Yao Noi. 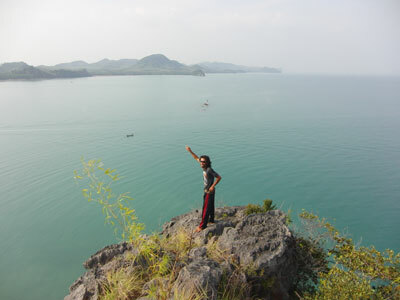 When Lek asked if we wanted to climb the hill I first thought he made a joke but he assured us that it would just take a few minutes to reach the top. 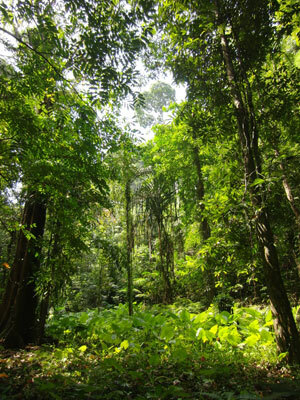 And indeed we made the climb in no time and were soon rewarded by a breathtaking view. 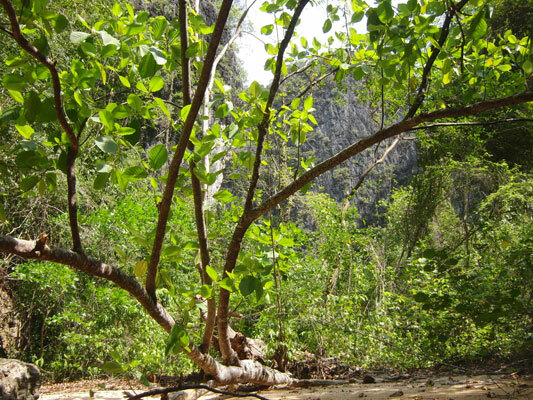 The descent was not as difficult as expected since you can grab a small tree here or a root there for support. 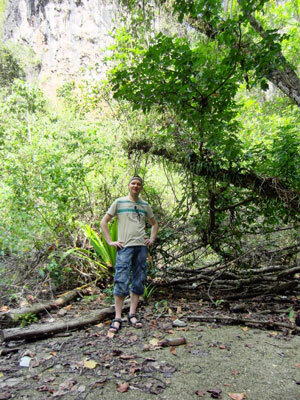 Only one of my outdoor sandals did not survive the climb and I had to finish barefoot. In the end we all made it safely back although drenched in sweat and so we jumped into the sea at once. We've been all the way up! 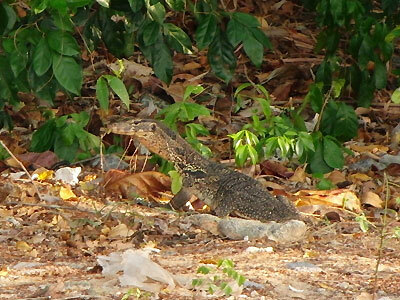 When strolling around a bit I could spot a monitor lizard of about one meter length in the bushes. I asked myself if it was actually living on that small island or only a short time visitor? 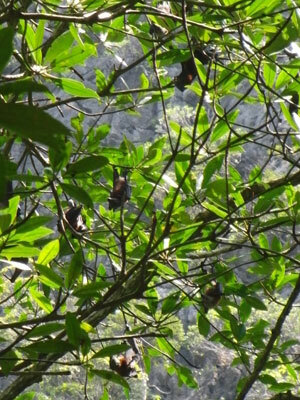 Later we returned to our resort. 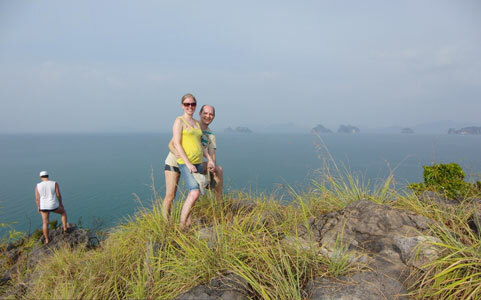 This was our last day on Koh Yao Noi, tomorrow we would take the ferry to Phuket and then go to the Khao Sok National Park by bus. Unfortunately the cash machine still did not work and so Pramot organised a money handover chain: he called a friend who is taxi driver to meet us at the Phuket pier. On the way to the bus station we would stop at a cash machine and give him the money. The taxi driver would give the money to the ferryman from whom Pramot would finally get his payment. So how did Pramot call it: "Easy, easy!"